Surveys for squirrels have to determine if red squirrel, grey squirrel or indeed both species are present. Finding pine cones that have been eaten by squirrels is a start, but it is not possible to tell if red squirrels or grey squirrels have eaten the cones unless the site is in one of the few remaining locations where grey squirrels haven’t colonised. The presence of red squirrel can be determined by walking transects early in the morning and searching for squirrels. Hair-tube surveys can also determine which species are present. This involves placing a number of short tubes into the trees in a grid system at a prescribed density which are are baited with squirrel food. At each end of the tube, sticky tape collects hairs from visiting squirrels. These hairs are examined under the microscope to identify the species. Once it established that red squirrels are present on a site, further work may be required to find any dreys present which would require protection during any development. Red squirrels are protected by the Wildlife and Countryside Act 1981, as amended. It is now possible to obtain a derogation license for ‘social, economic or environmental purposes’ which would cover activities that may have a detrimental effect on water voles and which would normally contravene the Act. Saving Scotland’s Red Squirrels is a project to stop the decline of Scotland’s core red squirrel populations. 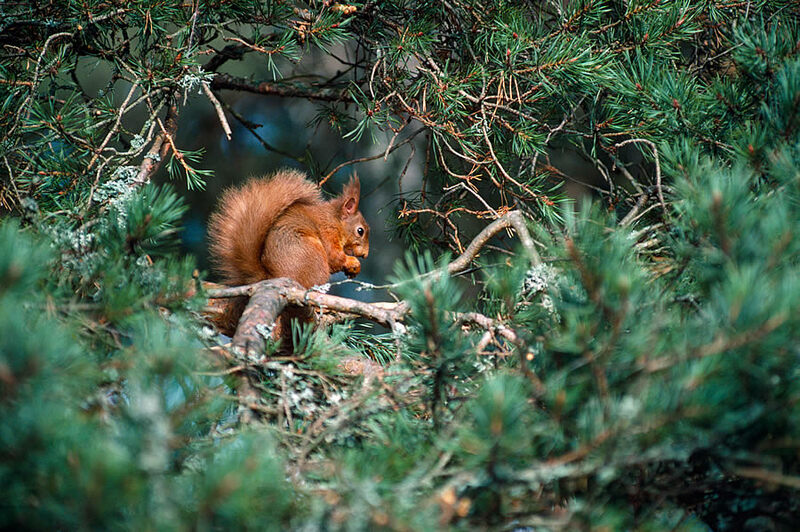 Working closely with local communities, the project is seeking to improve conditions for red squirrels across Scotland, and combat the spread of the non-native grey squirrel. Click here to visit the website. Squirrel dreys are often found where the tree splits into two. It is possible to tell if a cone has been eaten by squirrels, but there is no difference between cones eaten by red or grey squirrels.